Here on DQYDJ, we’ve often talked about how you can derive market forecasts of future inflation. It’s such a common topic that we built an automatically updating calculator to do daily inflation breakeven math for us. While calculating breakevens is one way to predict inflation, there is a simpler method: literal inflation surveys. 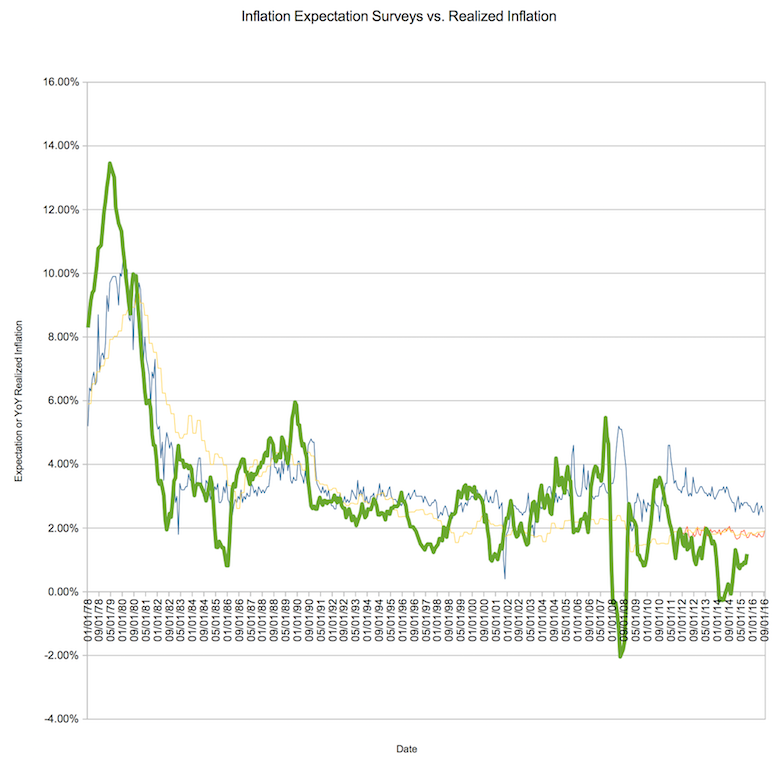 Let’s discuss some of those inflation surveys today! The idea of a revealed preference comes from Economics, where instead of asking people their preferences or opinions we look at their reactions to a change. In that way, we can see what people are actually doing, and see if it differs from how people said they would react. In a sense, polls before a vote and returns from an actual vote are similar; people might respond a certain way when asked about an upcoming election and behave entirely differently when in the booth. Breakevens are a revealed preference – based on economic conditions, the market settles on a specific price between treasuries and inflation adjusted securities. Weighted by all participants in that market, it shows how your peers are thinking. If you think future inflation will be higher you can buy TIPS and if you think it’ll be less you can buy regular Treasuries. Nothing more democratic than that, right? The other way to gather information on expectations or preferences is, of course, to ask people directly. That’s the main thrust of three surveys we’re going to cover today covering three main stakeholders in the inflation battle. We’ll look at consumers, businesses, and professional inflation forecasters and economists. Each is, of course, going to have their own biases and incentives. Businesses will want to predict input costs and forecast product costs out into the future. Forecasters want to impress with good predictions in order to keep or improve job prospects. Consumers want costs to stay under control, and want to know they can afford their lifestyles for another year. The Federal Reserve Bank of New York also has a consumer survey. You’ll have to bring your own interpretation to the ballgame – we’re just laying out the data. If we had a need to forecast inflation from a business standpoint, a mix of datapoints would probably be best. The Federal Reserve Bank of Cleveland uses breakevens, inflation swaps, inflation data and survey data mashed together. Perhaps that’s a good compromise? And, of course, that’s just the United States. In a global economy, your business might have to forecast inflation, exchange rates, and all sorts of other moving targets. So, dear reader, how do you deal with future inflation? Do you use results from inflation surveys, revealed preferences, or a blend? Do you perhaps just assume it’ll be 3% every year and call it a day? Let us know in the comments! Personally I prefer to use a (long-run) pessimistic 4%. That way there are very few surprizes.